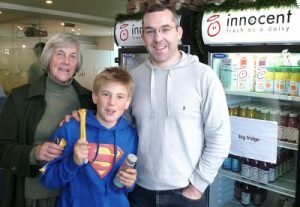 He was particularly impressed with the fact that they’ve got a kitchen to test out their recipes, a gym for employees to keep fit and best of all a fridge with an unlimited supply of Innocent juices and veg pots. Fruit Towers was a little surprising. For a start there were no ‘towers’ at all – it was all on one floor. 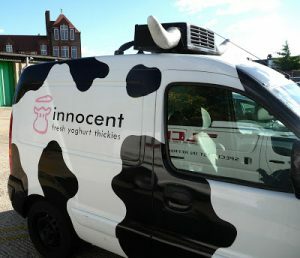 Also, outside the offices were a couple of rather unusual vans – one was covered in fake grass and the other was painted like a cow. The humourous tone continued inside. There was a whole wall of letters, photos and other things that people had sent in to show their appreciation of Innocent products. In another corner, there was a bag of woolly hats to put on Innocent bottles. One of their recent campaigns ‘The Big Knit’ encourages people to send in these their woolly offerings, which look like egg cosies. Innocent then put them on their bottles and for each one they use, they donate 25p to Age Concern. Another campaign is to be ‘bee-friendly’. With a promotion on their bottles they’re offering ‘buy one, get one bee’. Although they only use honey in one of their products, the concern is about bees as pollinators of plants – clearly bees play an important role in producing fruit. In fact 70% of the fruit used by Innocent has to be pollinated. Money raised will be used to help introduce 2 million more bees to the UK. Dig a bit behind the scenes at Innocent and I found that the buzz doesn’t fade – they’re working on water, energy, working conditions and supply chain best practice. One of the things I’m most impressed with is that when they discovered that the biodegradable plastics used in their bottles might not be the best environmental option, they stopped using it. Now they’re using 100% recycled plastic in their bottles and they’re one of the first companies to do this. What they do with their iconic cartons might be a more difficult challenge. Cartons have to be shipped abroad for recycling and there’s some debate about what they can usefully be made into. Watch this space. Monty’s now extended his collection from Innocent juice cartons to plastic bottles and veg pots. But we haven’t yet managed to get him any Veg pots because they’d run out on the day we went – and I’ve yet to try one out. 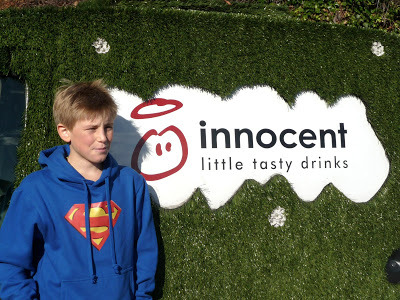 I thought he might be disappointed that Innocent didn’t make their drinks at Fruit Towers but he was inspired. His disappointment may come when he discovered that not all offices are such fun and not all companies have such a heart. This entry was posted in BLOG, Business, Food & drink, News 2010. Bookmark the permalink. It's just a shame they had to sell their company to Big Business Julia. Capitalism will always try to appropriate whenever it sees profit possibilities. Someone the homely and friendly messages on the sides of their cartons will never seem the same again.